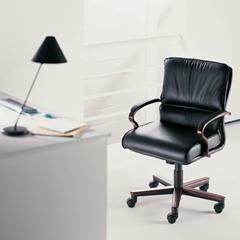 Whether you’re in the market for several cost-effective office chairs or a single executive chair made with traditional leather for your home workspace in Norcross, Georgia, NorthPoint Office Furniture is the company you can wholeheartedly rely on. Since 1994, local businesses and homeowners have trusted us as their high-end new and used office furniture solution. By only offering top-quality brand names in office seating, such as Humanscale, Fairfield, Lesro Office Star, and Global, we guarantee the utmost dependability, comfort, and style. For added assurance, all of our products are backed by generous manufacturer warranties. By visiting NorthPoint Office Furniture’s massive showroom that exhibits gorgeous, fully staged displays, you will be able to easily visualize our furniture in your own office. Furthermore, our showroom allows you to literally feel and compare the different types of office chairs and other furniture so you can find precisely what you’ve been searching for. If you are still unsure what pieces are right for you, one of our friendly, well-versed team members will gladly assist by explaining the various material and pricing options available to best meet your needs. To learn more about our wide variety of office chairs or the numerous other furnishings that we offer companies and homes in Norcross, GA, call NorthPoint Office Furniture today.